The lugarde Bonaire is a lovely large very adaptable cabin to suit all kinds of uses and layouts. The main feature is an elegant veranda which runs the whole width of the front of the cabin. Ideal for sitting out and enjoying a glass of wine, diiner or barbeque and you don't have to worry about the rain! 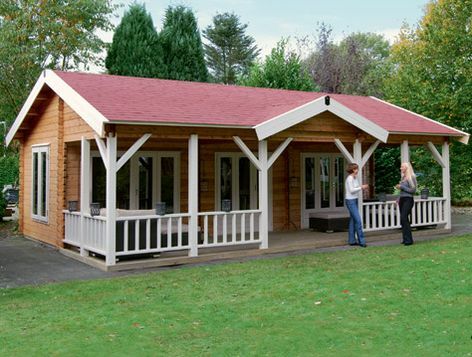 All Lugarde log cabins can be adapted to suit your wishes. 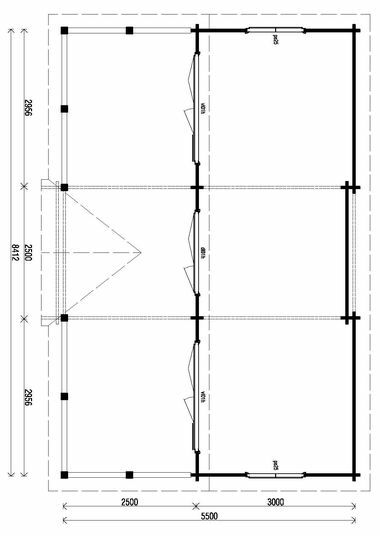 Size approximately 8.5m x 5.5m in 44mm log thickness or optional 68mm. The standard package includes 2 casement windows PE25, 2 folding doors VL01H and 1 folding door DL01H. The built in veranda measures approx 2.5m x 8.5m and includes the railings as shown. Please note: the Lugarde images shown are representative and may contain features which are not included in the price shown on this page. Veranda floor is an optional extra.